a It is generally considered that a good suspension design has little change in the roll center (RC) position during ride and roll changes. To this end, the suspension calculators include a visible indication of the static roll center location and the dynamic roll center location. The reporting tool also includes metrics for the static roll center and the dynamic roll center as well as the difference between both. The amount of change that is acceptable is up to you, but as a rule of the thumb for a road race car aim for as little change as possible. To this end the following generalisations of suspension design may help you get the most out of your design. The instant center (IC) width controls how the roll center acts during body roll. The wider the instant center width, the less negative camber gain is achieved during body roll. 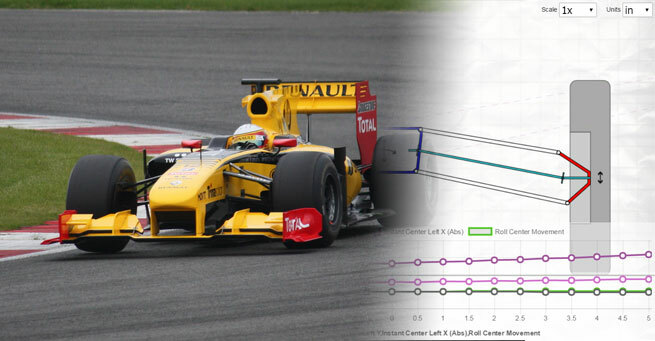 A narrow instant center width creates a more radical change and also makes the roll center height move up and down radically during body roll, which effects front tyre loading during corner entry and mid turn. The rapid movement of roll center when the system experiences small displacements can lead to stability problems with the vehicle. The roll center height has been shown to affect behaviour at the initiation of turns such as nimbleness and initial roll control. Here is an example of a model with good roll center control. If you move the suspension within its range -+3degrees roll and -+40mm ride the roll center doesn't move too much. 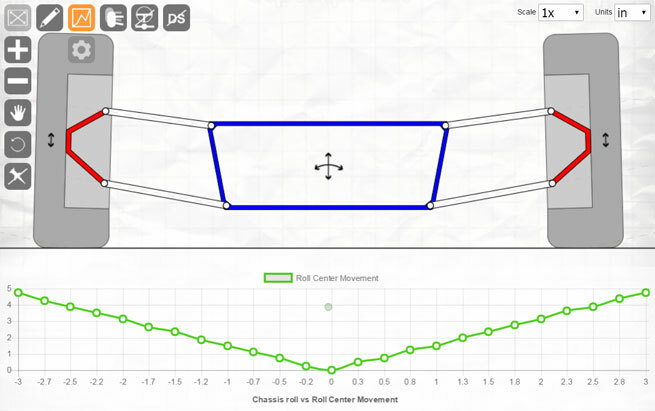 As a free user you can view the roll center movement and instant center width, but as a subscriber you can see the locaton of the dynamic roll center move in relation to the static roll center in real time.